Cuba's best-known claim to food fame is the Cubano, a toasted sandwich filled with roast pork, glazed ham, swiss cheese and dill pickles. 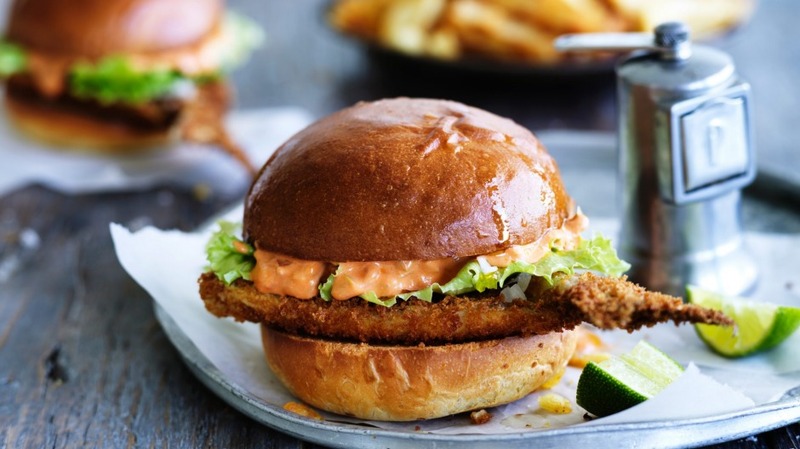 But this fish sandwich also deserves a share of the spotlight. The best Cuban fish sandwich is sold at a place in Miami called La Camaronera, where you eat standing elbow to elbow at the counter. For true authenticity, look for a fish small enough to fit whole inside the bun, and serve it butterflied, bones removed but the tail left on. 1. Make the soffrito by heating the olive oil in a medium saute pan over medium heat. Add the onions, capsicums, chilli and garlic with a pinch of salt. When they are soft and translucent, add the tomato puree and the white wine and simmer gently over low heat for about 10-15 minutes until everything comes together and the tomato/wine is reduced by half. Finish by seasoning with a bit of salt to taste and set aside to cool. 2. When cool, mix the soffrito with the mayonnaise and a few dashes of Tabasco and keep in the fridge. This makes more than you need for the sandwiches but it will keep for a couple of weeks in the fridge. (It's a delicious dipping sauce for cooked prawns or potato croquettes). 3. When you're ready to make your sandwiches, season the fillets with salt and let them sit for a few minutes to allow that to sink in. Set up three bowls or deep plates with flour in one, the whisked eggs in another and breadcrumbs in the last, and a flat plate at the end of your assembly line. Coat the fish in flour, then drag through the egg and finally coat in the breadcrumbs and set aside. Repeat with the remaining fish. 4. Heat about two centimetres of frying oil in a large saute pan over medium-high flame. When the oil reaches 180C-190C, add the fish to the pan. (If you don't have a thermometer, you'll know it's the right temperature if the oil bubbles rapidly when you add the fish. If it doesn't, take the fish out and let the oil get hotter). When the fish is golden-brown, flip it and cook the other side. Remove from the pan, drain on a paper towel and immediately sprinkle with some salt. 5. Build your sandwiches by splitting the buns in half and placing the fish on the bottom half of each bun. Top with iceberg lettuce, some finely chopped onions and a good spoonful of soffrito mayonnaise. Add the top of the bun and serve with homemade fries. Tip: Try to find a soft white sandwich roll that has a thin, crisp crust and tender crumb. Something chewy like a baguette simply will not be right. As for the fish, choose something flaky, thin and tender like a sand whiting or red spot whiting, or a small, skinned snapper or flathead.